40pc community leaders youths hailed | Daily Express Online, Sabah, Malaysia. 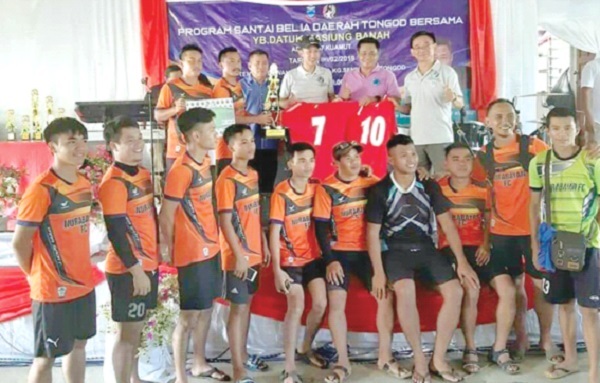 TONGOD: The proposal to set 40 per cent of the youths to be appointed as Village Community Management (MPKK) and Village Head (KK) in the Kuamut State Legislative Assembly (DUN) was welcomed by Gabungan Belia Wawasan Tongod. Its President Elvenson Henly Jumali, said the appointment of MPKK among the youths, especially in the Kuamut constituency, was able to voice their ideas and stimulate activities and development especially in Tongod. He said before the change in government, the positions then known as the Village Security and Development Committee (JKKK), was more for senior leaders. “However, this does not mean that elderly leaders are not able to engage in activities or boost development,” he said. Elvenson said many youths today have leadership qualities that not only can do their job well but are also respected by the community. He cited the creation of the Sabah Youth Council by the government which was intended to create visionary youths who have leadership qualities to lead a body of institutions or associations, hence, these should be given the opportunity to be appointed as MPKK. He was speaking to the media at the Tongod District Youth Santai Programme with Kuamut Assemblyman Datuk Masiung Banah at Kg Semundoh Hall, Tongod, recently. He said the Tongod District Council members were represented by six youths from the area. “The appointment of youth as Member of the Tongod District Council is proof the youth is able to carry out their tasks especially to assist the government in implementing development especially in rural areas,” he said. Commenting on the Tongod District Youth Santai programme, he said it was among the joint efforts of youth associations in the district to approach government leaders to enable youths to seek clarification on current government aspirations in implementing policies or development.